Lyon Ready To Assemble Steel Lockers Create Secure Storage For Personal Items In Schools, Gyms, Warehouses, Hospitals And Other Facilities. Lyon storage lockers have a padlockable hasp as an integral part of the handle. Legs add 6 to height. Single and Double Tier Steel Lockers accept either padlocks or built-in locks (sold separately). 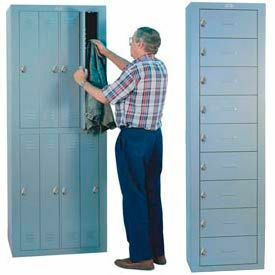 Single Tier Steel Lockers are the most practical and widely used of all storage lockers. 12 D & 15 D School Lockers have a center ceiling double prong hook. 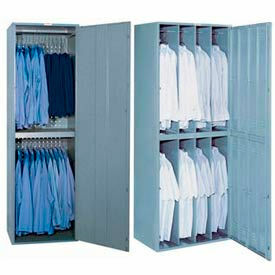 18 D & 21 D Single Tier Lockers include coat rods for hanging clothing. Double and Triple Tier Office Lockers are great for short-term use and storage of shorter length garments. These metal lockers include one double-prong and three single-prong coat hooks. Four, Five, or Six Tier Lockers are used for the storage of high density or individual belongings and supplies. Lyon recommends anchoring steel lockers to floor and/or wall for safety. Optional Number Plates can be added to all lockers for quick identification. Assembled storage lockers are non-returnable. Lyon storage lockers are available in Gray or Putty. Limited Warranty. Lyon® Personal Effects Lockers Are Used For Use At Health Care Facilities, Restaurants, Garages And More. Personal effects lockers are made for storage of more compact items, allowing more space-efficient storage. All lockers are steel with 18-gauge steel framing for lasting strength and durability. Choose from Turn-Lock doors or Built-In Combination Lock. Available colors are gray and putty. Privacy Lockers are the used size for lunches, purses, books and other small items. Privacy lockers are available in 9 Compartment or 10 Compartment configurations. 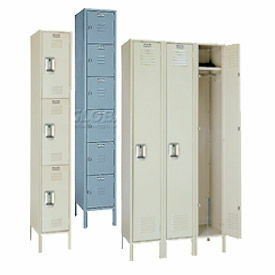 Apparel Lockers are used for storage of bulky garments such as jackets or coveralls. Doors are louvered for ventilation. Lockers are double tiered to save floor space. Available in sets of 4 Lockers or 8 Lockers. Fully assembled. Lifetime Limited Warranty. Lyon® ExchangeMaster® Lockers Provide An Effective Security System For Storing Uniforms, Linens, Personal Items And More. ExchangeMaster® Lockers provide up to 16 people with an individual locker compartment while a master door allows easy access by supervisors or maintenance personnel for servicing. Made using 16 gauge steel framing and 22 gauge steel doors. Hanging Garment Lockers are available in multiple configurations to accommodate various volumes of hanging garments. Folded Garment Lockers keep uniform garments neatly folded and secure. SupplyMaster II® Service Lockers are made for disposal of soiled clothing and linens. Swinging panel at top allows items to be dropped into lower compartment. Multi-point latching system remains locked until opened by authorized personnel. Back is perforated for ventilation. Lifetime Limited Warranty. 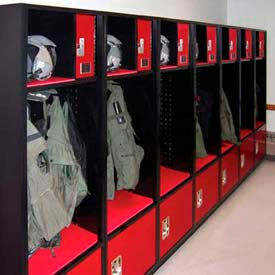 Lyon® Command Gear Lockers Are Inspired By Military Pilots Equipment Storage Needs. Command gear lockers are made with heavy-duty all-welded steel for lasting durability. Includes a top shelf open storage area for helmets, a lockable upper compartment for personal effects and lockable lower storage compartment for additional equipment. Large compartment houses a torso harness, G-suit/G-vest, survival vest and more. Includes heavy duty 18 gauge x 5/8 diameter hanging rods and 2 side coat hooks. Ventilated sides ensure air circulation. Lockers measure 24 W x 24 D x 72 H. Lifetime Limited Warranty. Lyon® Locker Accessories Enhance The Look And Safe Use Of Lyon® Lockers. 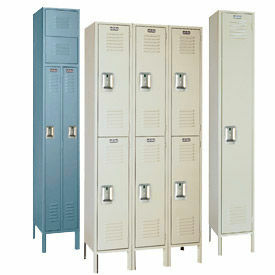 Locker accessories provide safe anchoring of lockers and enhancement of appearance. Available colors for cosmetic locker accessories are putty and gray. Anchoring Angles provide a bearing surface for lockers without legs. Locker Foot is used for keeping lockers with legs anchored and stable. Closed-Style Bases are available for locker fronts and ends to cover gaps and prevent dust and debris buildup. Front Expansion Fillers are used to close spaces between lockers to ensure anchoring and prevent buildup of dust between lockers. Top Fillers and Top Closures are used to close off spaces on the tops of lockers. Available flat or sloping. Available for lockers with or without legs. Number Kit includes aluminum number plates with numerals etched in black. Numbers stocked from 1 through 999. Lifetime Limited Warranty.